The prevention of publication malpractice is the responsibility of each individual author, reviewer, editor and publisher. This clear and consistent Publication Ethics and Malpractice Statement is displayed on the Economic Horizons journal's website. 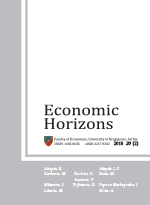 Simultaneously, the Editorial Board of the Journal and the Faculty of Economics, as the publisher of Economic Horizons, take responsibility for conducting this policy of the Journal. First of all, in the field of Publication and Authorship, it is important that each published article should contain the list of references and the institution - if one exists - which has financially supported the research carried out. The article must not be a plagiarism, and must not contain fraudulent data, either. It is also forbidden to publish the same research in more than one journal. All authors must significantly contribute to the research. Authors are obliged to sign a statement that all the research in the submitted manuscript is original and that the content reproduced from other sources is acknowledged and referenced. Apart from this, authors should confirm that all the data stated in the article are real and authentic, and that - in case of need - provide the retraction of the article or the corrections of mistakes. Authors should also confirm that the manuscript submitted for reviewing is not in the procedure of being reviewed nor has been accepted for publication in any other journal. All manuscripts submitted to the Editorial Board of the Journal are subject to the iThenticate Professional Plagiarism Prevention check. Through an objective and timely review of the submitted manuscripts, reviewers should contribute to the decision-making process and help improve the quality of the published article. Reviewers must not have any conflict of interest with respect to the research, the authors and/or the research funders. Reviewers are expected to warn the editor of any published or submitted content essentially similar to the manuscript being reviewed. Reviewers should point out the relevant published work which is not cited in the manuscript. Reviewed articles should be treated confidentially. Manuscripts must not be retained, or copied, either. The editor is expected to act in a balanced, objective and fair way in the performing of his/her expected duties, not discriminating authors on any grounds. The editor has complete responsibility and authority to reject/accept an article. The editor should have no conflict of interest with respect to articles he/she rejects/accepts. An article is accepted when it is reasonably certain. Once errors have been found, the editor promotes publication of correction or retraction. The editor is responsible for preserving the anonymity of reviewers. In the case of complaints of an ethical or conflict nature, the editor should adopt and conduct acceptable procedures which are in compliance with the policies and procedures of the related society. Authors should be given an opportunity to respond to any complaint. The Faculty of Economics of University in Kragujevac, as the publisher of the Economic Horizons scientific journal, will ensure the maintenance of good practice according to the above outlined standards. To prevent plagiarisms / auto-plagiarisms and fraudulent data from being published.